Soon people are sneezing and dying all over Manchester. Telekinetic cop Sybil Jones knows that, like Coyote, they died happy – but even a happy death can be a murder. As exotic blooms begin to flower all over the city, the pollen count is racing towards 2000 and Sybil is running out of time. 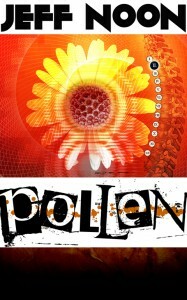 Pollen is the sequel to Vurt.